How does Advanced Password Manager work? Advanced Password Manager is a tool to help you organize your passwords in one vault across browsers. You have to load these passwords only once and lock them securely using a master key. So you just have to remember the master key you created. Someone may gain access to your personal information on your browsers without your knowledge. This will put your personal info at risk. A person can easily hack your passwords and can then attempt to access your financial and email accounts to impersonate you. A person can pretend to be you and can use your credit card details. This will put your assets and other personal information at risk. Someone who stole your identity may ruin your reputation, finances and family, leaving you responsible for damages caused by the theft. How Secure is Advanced Password Manager? Advanced Password Manager allows you to create a master password for all your accounts. This master password is known to you and not anyone else. Even we don’t know it since it is encrypted on our servers. With its browser add-on installed, auto-filling site credentials is very easy. AES-256 encryption: A threat to hackers! 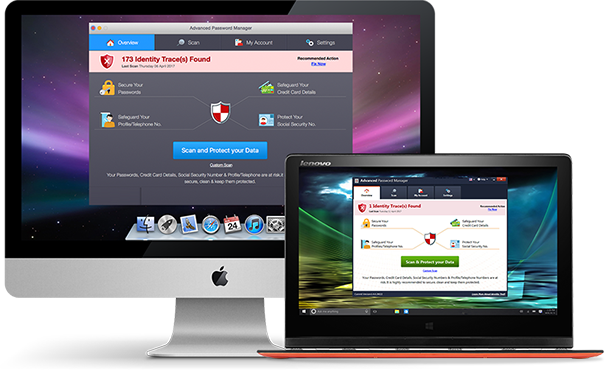 PC/Mac Scan: Scan & clean all security traces from your PC or Mac. One of the best and the most intuitive Password Manager I have come across. I love using Advanced Password Manager as it's easy and I know I am safe. It secures all my passwords and confidential information and moreover helps me fill the forms automatically. It is an excellent software. It helps saving all your passwords and protect them with a single password which is amazing. It works flawlessly and can be accessed across multiple devices. The ability to save all the personal and payment information makes it easy to shop and pay online. This software does everything that you expect out of a password manager. It is really fast, secure and saves me from any kind of risk of theft and protects my identity. I am really happy with this software. It is very convenient and easy to use. It's worth it!